Johnny Carver rings the Career Bell upon learning the Indiana Pacers basketball organization had hired him for the summer of 2016. The bell ringing is a tradition at the Sam M. Walton College of Business when students learn they have been hired for a job or an internship. Long before Johnny Carver’s first dribble in his driveway, he loved basketball. Basketball was a Carver thing. His father, and then his brother, set scoring records at Shawnee Mission Northwest High School in Shawnee, Kansas. Everyone expected Johnny to follow in their Converse footsteps and outscore them. And he would have, too, except his body failed him. That, however, didn’t end his love of the game. He still might make a career in the National Basketball Association, but not as a player. Instead of running up and down the court, he may be running the numbers in the front office. Johnny Carver is a junior at the University of Arkansas’ Sam M. Walton College of Business, and since he can’t play on a team, he wants to help build one. He likes the sound of “general manager.” The story of his life is so remarkable – and he is still in college – that Sports Illustrated has written about him. From the age of 5, Mr. Carver could spout NBA names and statistics, a talent with which his parents entertained their friends. He has published a book, which he started writing while he was in high school. He has created a formula for ranking all the players in NBA history. In pursuit of his basketball goals, Mr. 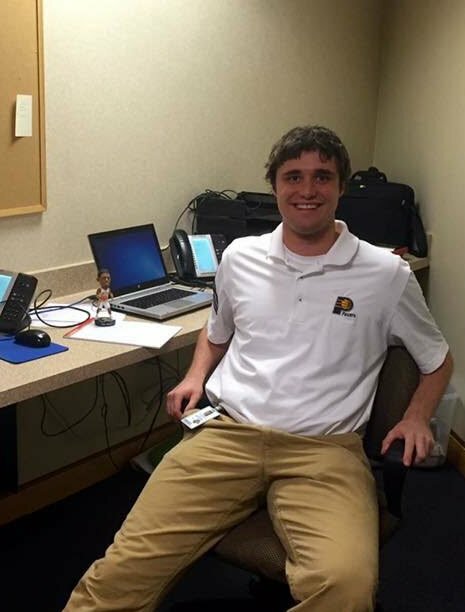 Carver spent the summer of 2016 as an intern on the business side of the Indiana Pacer’s franchise, where NBA legend Larry Bird is the general manager. At the request of AMP, Mr. Carver has written about his summer. He talks about the skills he took with him from the Walton school to Indianapolis, and about the things he learned in in the Pacers’ front office that they don’t teach you in college.Johnny also is a savvy marketer. He politely ignores all questions about the No. 1 ranking. You’ll have to buy the book to find out who is the best. At his website, you can watch and read interviews with Johnny. I was born to work in basketball. My father played for Kansas State University and my brother for the College of the Holy Cross. At Shawnee Mission Northwest High School in Shawnee, Kansas, they both broke the all-time scoring record. I played competitively until health complications derailed my career prior to my senior year of high school. I began to study NBA history at five years old. My parents showed me off to their friends, who would quiz me. As I grew older, I wanted to know everything about basketball, from its rich history to its tactics. I was chosen as the lone basketball operations intern for the summer through an extremely competitive application process. 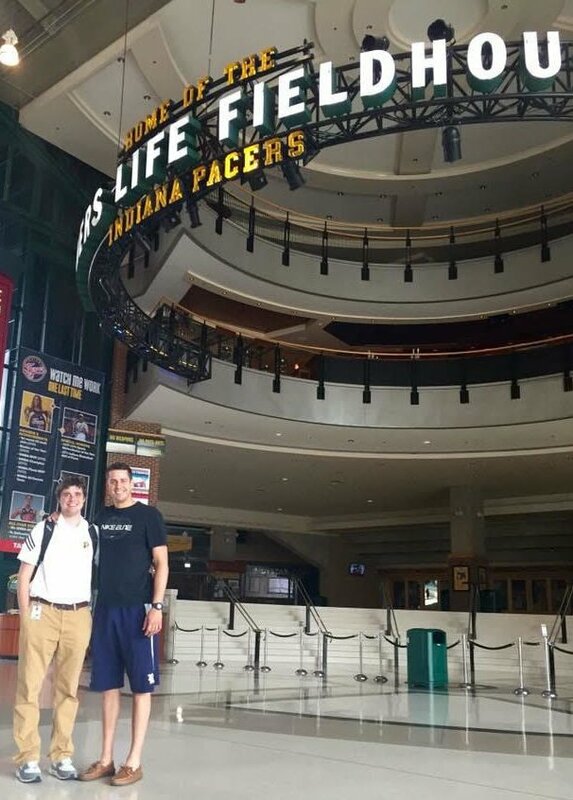 Johnny Carver at the Indiana Pacer’s arena in Indianapolis. 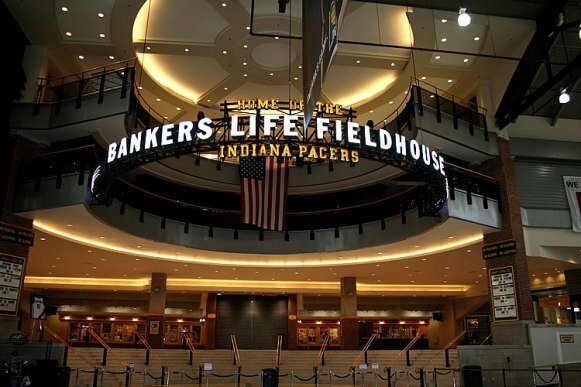 Every morning, I would walk from the parking garage into Bankers Life Fieldhouse through a connection bridge. I would then ride the escalator down to the lobby of the arena to get to my office. My family owns a small business in Kansas City, so the idea that my office was a giant basketball arena was so exciting. Every day I was aware that I worked in one of the coolest offices in the country. Work is a lot easier when you work at a sports arena. I interacted with players on a regular basis. Since I grew up in a family of collegiate basketball players, and around people who made it to the NBA, I saw them as regular people rather than as star professional athletes. 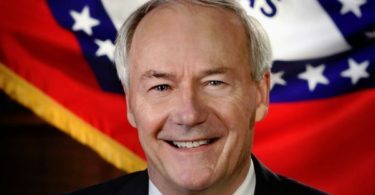 Now, thanks to the University of Arkansas and the Pacers, I understand better what it takes to keep a professional sports organization going so that it can have a history. One course in particular, “Managing People and Organizations,” prepared me to work under Indiana native Larry Bird, the Pacers’ president of basketball operations. Teams, like corporations, need to create a workplace culture. The most successful teams implement this culture and find employees who fit in the goals of the organization. The Pacers, both through management and players, have created a hardworking and humble culture under Mr. Bird’s direction. 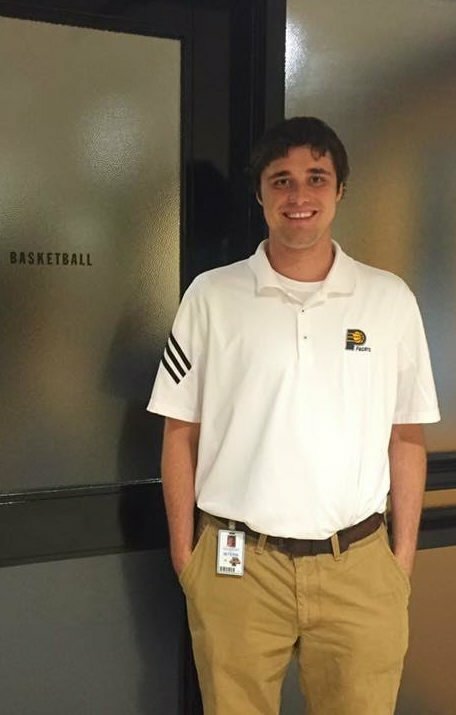 During my time with the Pacers, I used the analytical processes I learned as a business analytics minor to complete basketball-related projects for the Pacers’ front-office staff. I used my understanding of finance from various business-core courses to work with the NBA salary cap. My experiences in Introduction to Business Law helped me better comprehend the clauses of the collective bargaining agreement for player contracts. Even learning Microsoft Office was an important skillset for my success. The curriculum from the Walton College prepared me in a lot of ways. When you think of basketball operations, you don’t usually see that as business oriented. But at the end of the day, I worked in an office and used the same business skills that most business interns use in other fields. I learned the importance of good communication. You learn many technical skills in college, but communication is something that comes through experience. Business etiquette can mean something different in every environment. Every company has its own environment and its own set of rules, and the NBA is no different. I learned that it’s important to be cognizant of that. Communication is the most important aspect of fitting into a workplace culture. Sports business is different, because external motivation is so easy to find. Everyone is so competitive, and the common goal of pursuing a championship is an obvious one that everyone can get behind. Often times, businesses have to come up with creative ways to motivate their employees to work together and buy into the goals of the company as a whole. The people who work for sports organizations are mostly competitive and hard-working by nature. The fact that an entire city and fan base desperately wants your team to win amplifies the motivation. People don’t always think of sports as a business. People who play video games think that working in professional sports involves nothing but making trades and signing players. It looks so easy sometimes from the outside. But there are many layers, rules, and other obligations that come with working in basketball operations. They have computers, cubicles, and staplers just like any other company. The only difference is that their goal is to improve their team and win. I was surprised with how much access and trust that they gave me. I felt like I was involved with a lot of really important processes as an intern. I hear stories of other internships where they felt like they were just given busy work, and I always felt like it was the opposite for me. Everything that I was involved with felt like it was important. I want to work for an NBA organization in a position where I can be involved in basketball-related decisions. I feel like I have a great understanding of the game, but I want to continue to learn so that I can be a provide an impact that will matter. 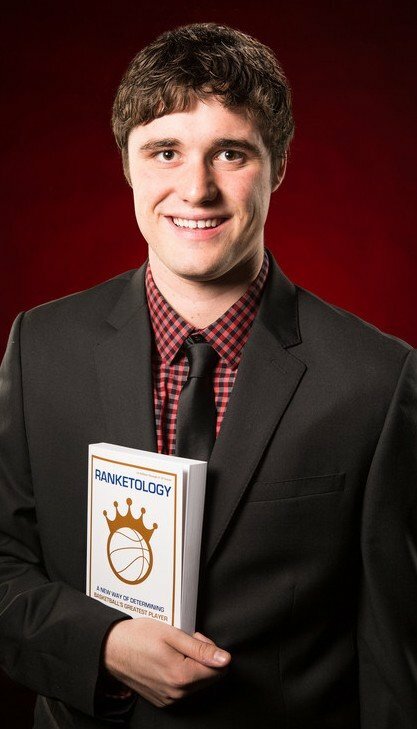 My book Ranketology: A New Way of Determining Basketball’s Greatest Player is based on an algorithm that I created to rank the best players in NBA history. The formula makes use of my ability to use analytics and statistics to approach the game from a unique viewpoint. My internship gave me experience I need to better understand what it takes to put together a competitive NBA team. I built the algorithm on nineteen categories, such as NBA Finals MVPs, number of championships, total career points, number of times selected for the All-NBA Team, with each category holding a statistical weight. There are separate scales for players who played before, during, and after the NBA Finals MVP was created in the 1968-1969 season. Those who played before are measured on a scale that has eighteen categories (excluding the Finals MVP); those who played before and after are calculated using an average of both scales. I compared the best 75 players in NBA history (including 10 current players), and from that, I calculated their legacies. I determined these 75 by using the list of the 50 greatest that the NBA established in 1996. To that I added Hall of Famers who hadn’t been included. 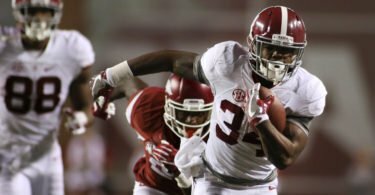 I tested 10 current players to see who would work best in the system. The first part of the book explains the algorithm itself and the results, and then I wrote profiles of each of the Top 25 players. In those profiles, I summarized their career on a year-by-year basis. Then I wrote about their accomplishments, such as their greatest performances, greatest achievement, and the legacy that each left in his era. Hogs 30. Crimson Tide 49.